The final game of wild card weekend pits the Green Bay Packers at Washington Redskins. During the off season Green Bay was expected to be a Super Bowl contender, and the Pack is in the post-season for the seventh consecutive season. Washington on the other hand was viewed as being one of worst teams in the league before the season began; this is just their second winning season in eight years, and their last playoff victory came ten years ago when Joe Gibbs was still the head coach for Washington. Who: #5 Green Bay Packers (10-6) at #4 Washington Redskins (9-7). What: NFC Wild Card Game. When: Sunday, January 10 at 4:40 pm ET on FOX. Where: FedEx Field, Landover MD; surface is natural grass. Coaches: Green Bay’s Mike McCarthy (104-55-1, .653 in regular season; 7-6, .538 in playoffs; 8 winning seasons in 10 years). Washington’s Jay Gruden (13-19, .406 in two seasons; zero playoff experience; one winning season in two years). Odds: Washington opened as a 1-point favorite, but the line swung to a pick’em and then Green Bay minus one. As of Saturday night the betting line had swung back once again to Washington being favored by one in most venues, with many listing this as a pick’em. I found only one site (5Dimes) that was on the other side of the ledger, with Green Bay minus one point. The over/under is 45½ and a typical Money Line has Washington -115 and Green Bay -105. The spread dollars are fairly evenly split (53% on Green Bay, 47% on Washington), but the ML dollars lean more heavily on the Pack (69%-31%). 83% of the betting public thinks this will be a high scoring game, taking the over. Green Bay would have been a prohibitive favorite against whatever team came out of the NFC East, but after looking dismal in a 38-8 loss to Arizona and then laying an egg in last week’s loss to Minnesota, it is difficult to have any confidence in the Packers. Green Bay went 4-6 over their last ten games, and that would have been 3-7 if not for a Hail Mary against a poor Detroit defense after a questionable penalty. The Packers are beat up, with about one-third of their roster – 17 players – on the injury report. Two starters in particular stand out: CB Sam Shields (doubtful, concussion) and LT David Bakhtiari (questionable, ankle). At first glance the absence of Shields is minimal, since he has not played in four weeks. However, Kirk Cousins has passed for 300 yards in three of Washington’s four straight wins. In the one other game Cousins completed 80% of his 15 passes, including three touchdowns. LG Josh Sitton (#71) has filled in for Bakhtiari (#69) the last two weeks, but HC Mike McCarthy has stated that will not be the case Sunday. Washington’s pass rush improved over the last month (20 sacks in the last four games), and Aaron Rodgers has been under duress of late, sacked an unacceptable 14 times for a loss of 95 yards over just the last two games. The Skins like to bring an extra pass rusher rather as often as any team in the league; the results of that feast or famine approach will likely determine the outcome of this game. That philosophy leaves their secondary in one-on-one coverage; with three of their six top defensive backs on injured reserve, Washington is vulnerable in the secondary. If Green Bay can be creative with their pass protection and give Aaron Rodgers time, then the Packers can exploit the Washington defense. Washington scored an average of 33 points during a four-game win streak to finish the season, but the fact remains that the Skins were 0-3 against teams that finished with winning records. WR DeSean Jackson (#11) can beat defenses deep with his speed, WR Pierre Garcon (#88) has scored in three straight games, and now that he is healthy Jordan Reed (#86; 29 receptions for 378 yards and five touchdowns in his last four games) has emerged as one of the best tight ends in the league. However, the Washington defense is average overall. 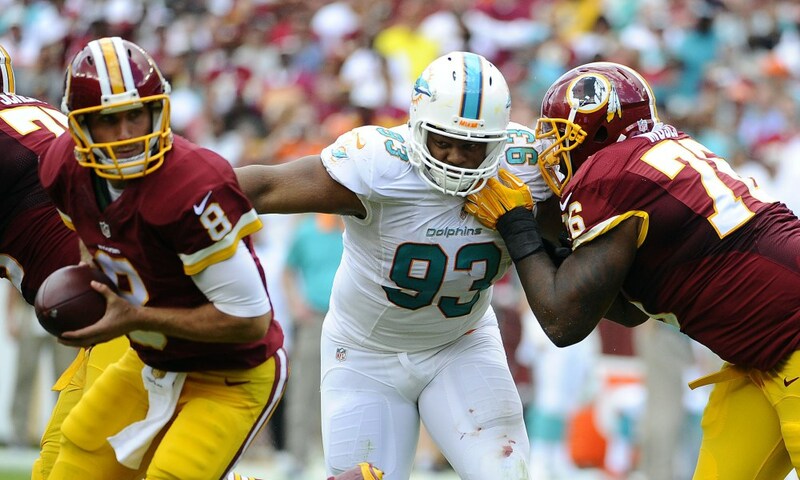 NT Pot Roast Knighton (#98) is a force up front, and WLB Ryan Kerrigan (#91) has become a force. The 2011 first round pick recorded 9½ sacks this season along with three hits and 46 hurries. The matchup between Kerrigan and Green Bay RT Bryan Bulaga (#75) could be pivotal to the outcome of this game. Since Week 7 Kirk Cousins leads the NFL in completion percentage (72.4) and passer rating (119.1), and has a jaw dropping TD:INT ratio: 23 touchdown passes with only three interceptions. Cousins has thrown for 11 scores without a pick over his last three games, with Washington’s offense averaging 35.7 points and 429 yards in that span. His fifth-ranked passer rating of 101.6 included performances of 100-plus in each of the last six games. Looking at how the two clubs have played down the stretch, you would have to pick Washington at home. Add in the way that the Green Bay offense has underwhelmed over most of the last ten weeks, and there is plenty of logic to believe that the Cheese Heads’ season comes to a shocking end Sunday. However, Washington’s weak defense – specifically their secondary – could be exactly the cure for the Pack’s late season malaise. A slight lean to Washington in this game. 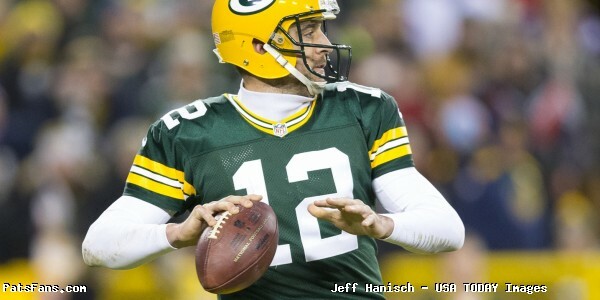 This entry was posted in Uncategorized and tagged 2015 NFL Season, 2015 Playoffs, Aaron Rodgers, against the spread, betting line, FOX, Green Bay Packers, Kirk Cousins, NFC, odds, television, tv, Washington Redskins on January 10, 2016 by John Morgan. 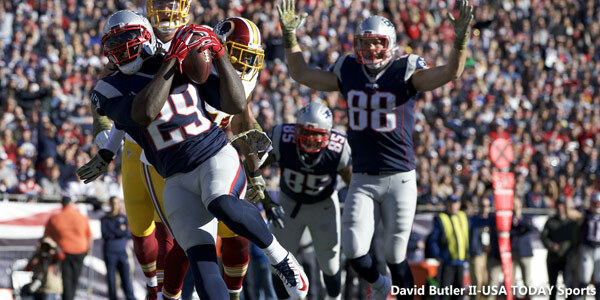 The Patriots routed the Redskins easily 27-10 in a workman-like approach on Sunday afternoon at Gillette Stadium. Tom Brady and LaGarrette Blount were the big stars of the offense as the Patriots rolled easily to their second 8-0 start in team history. Brady completed 26 of 39 passes for 299 yards and two touchdowns. He also threw an ill-advised interception in what was a sloppy but productive first quarter. Blount rushed 29 times for 129 yards and a touchdown in what was his biggest workload of the season. The Patriots took the opening kickoff and marched down the field easily with Brady finishing off the drive with a touchdown pass to Edelman. Although they turned the ball over twice with a pick and an Edelman fumble, the offense set the tone early in this one and they cruised after that. By the ten minute mark the Patriots had more touchdowns (2) than the Redskins had plays from scrimmage (1). Washington didn’t have the offensive weapons to challenge after that and this one was never in doubt. But the victory was a costly one for New England. Dion Lewis went down with a knee injury in the second half and the prognosis isn’t good. Adam Schefter of ESPN reported that there was looseness in his knee which usually means an ACL type injury. Lewis is scheduled for an MRI on Monday morning. Brandon Bolden and Blount finished up in the backfield for the Patriots as James White was inactive. Sebastian Vollmer left in the first half with what was described as a head injury which probably means a concussion. Entering the game with six healthy offensive linemen, Vollmer’s left them with five and TE Michael Williams played some right tackle as did C Bryan Stork who returned in his first action since training camp. DeGuglielmo Deserves Big Kudos: With the absolute injury epidemic along the offensive line the Patriots had a left tackle (Cameron Fleming) who was on the practice squad a few weeks ago playing left tackle, a position he’s never played before even in high school. Stork was playing right tackle as was a tight end Williams and the Patriots offense still scored 27 points. The fact that they still operated at a high level despite these injuries is a feather in the cap for the 2nd year Patriots offensive line coach. DeGuglielmo is doing a magnificent job with his charges and the offensive continues to hum along. He is preparing his players to move anywhere along the line and as scary as the situation is right now, he’s been outstanding at allaying any fears about the offensive line. We wrote about him in our last Sunday news and notes, remarking on the job he’s doing and it needs repeating again. While the play-calling definitely got more conservative with the makeshift line in the second half, they were still able to move the ball and scored a 4th quarter, 18-yard touchdown on a nice pass from Brady to Brandon Bolden , his first ever touchdown reception. 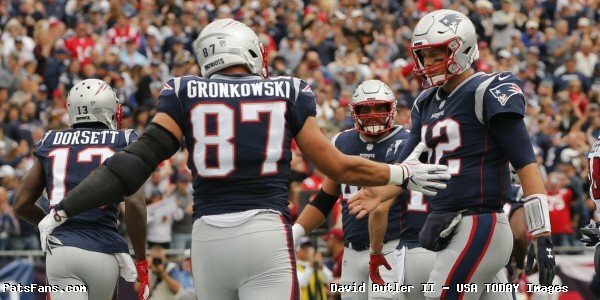 Rob Gronkowski wasn’t targeted as much on the day and had a four catch, 47 yard effort for the game. Defense With a Solid Effort: Once again the Patriots defense put out another solid effort limiting the Redskins to just three points until a garbage time drive scored their only touchdown with just 20 seconds left in the game. Redskins’ running backs averaged only 2.5 yards per carry with Matt Jones carrying 11 times for 27 yards and Alfred Morris carrying four times for 10 yards. Kirk Cousins completed 22 of 40 passes for 217 yards with one touchdown and one interception. But he was victimized all day with terrible drops by his receiver core, seven in all. But when all was said and done, he had only 134 yards passing before that final garbage time drive of 83 yards, all in the air. Malcolm Butler was matched up against DeSean Jackson for most of the day and held the explosive Washington receiver to just three catches for 15 yards. It was a testament to how well he played (with over the top help), that we didn’t hear his name called much. Logan Ryan put together another solid performance and came away with his team leading fourth interception. While the Skins offense won’t be confused with some of the better ones in the NFL, it was still a solid effort by the Patriots giving up a total of 254 total yards on the day. LaFell Rounding into Shape: Brandon LaFell had a nice game for the Patriots on Sunday catching five passes for 102 yards. After missing all of the spring and summer, his first action since the Super Bowl was the game a few weeks ago against the Jets. Since that one where he dropped half a dozen passes, he’s been progressively getting better and more in sync with Brady. Sunday was his best effort yet and makes the offense that much more dangerous. He was wide open for a deep touchdown early in the game but Brady was under pressure and was hit as he let the ball go and LaFell had to wait for the ball to come down. It was still a 48-yard reception, the longest of the day. 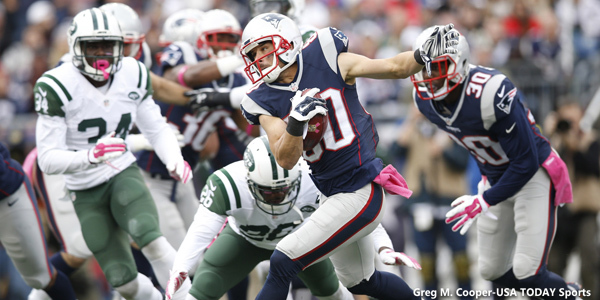 The Patriots move on to take on the New York Giants next week in the Meadowlands. The Giants offense should present a big challenge for the Patriots defense as Eli Manning and the Giants passing game has plenty of weapons. The Giants defense has been horrid but with the return of Jason Pierre-Paul, gives them a pass rusher that can wreak havoc in the backfield. Given the state of the Patriots offensive line, that can’t be overlooked. We’ll have more about that next week. So only two teams remain undefeated in the AFC with the Denver loss…We’re on to the Giants. 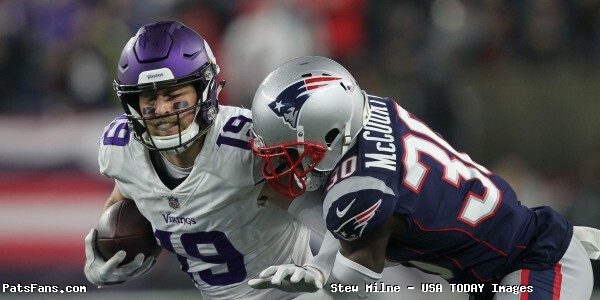 This entry was posted in Patriots Commentary, Patriots News and tagged 2015 NFL Season, Brandon LaFell, Bryan Stork, Chandler Jones, Danny Amendola, DeSean Jackson, Dion Lewis, Julian Edelman, Kirk Cousins, LaGarrette Blount, Malcolm Butler, New England Patriots, NFL, Patriots, Patriots edge rushers, Pats, Pierre Garcon, Rob Gronkowski, Rob Ninkovich, Tom Brady, Washington Redskins on November 9, 2015 by Steve Balestrieri. The Patriots finish off a three game home stand with a Sunday afternoon matchup against the Washington Redskins. After wins over the Jets and Dolphins the Patriots are looking to go 8-0 to start the season. Kickoff is scheduled for 1 p.m. and the game will be televised on Fox with Kevin Burkhardt, John Lynch on the call with Pam Oliver handling sideline duties. The game can be seen locally on Fox 25 and as always the radio call is on the Patriots flagship station 98.5 with Bob Socci and Scott Zolak on the call. The Redskins (3-4) had a big come-from-behind win over the Tampa Bay Bucs 31-30. After falling behind 24-0, the Skins rallied behind Kirk Cousins who quarterbacked them to a game winning touchdown pass with under a minute left. In the downtrodden NFC East this season, Washington is only a half game out of the division lead. The Patriots (7-0), dominated the Miami Dolphins 36-7 behind another stellar Tom Brady performance. 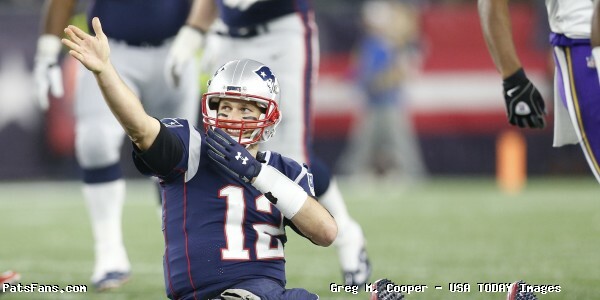 Brady completed 26 – 38 passes for 356 yards and four touchdowns and is leading the NFL in passer rating with 115.8. On the season he has 20 touchdown passes against only one interception. Series History: The Patriots and Redskins will meet for only the 10th time in their history. The Redskins lead overall 6-3 and won six straight contests between 1978 and 2003. The Patriots won the last two including their last meeting a 34-27 meeting in Washington in 2011. This entry was posted in Patriots Commentary, Patriots News and tagged 2015 NFL Season, against the spread, Alfred Morris, Bill Belichick, Brandon LaFell, Buffalo Bills, Chandler Jones, Danny Amendola, DeSean Jackson, Foxboro Stadium, Jabaal Sheard, Jay Gruden, Julian Edelman, Kirk Cousins, LaGarrette Blount, Malcolm Butler, Miami Dolphins, New England Patriots, NFL, Patriots, Patriots edge rushers, Pats, picks, Pierre Garcon, predictions, Rob Gronkowski, Rob Ninkovich, Ryan Kerrigan, Tom Brady, Washington Redskins on November 5, 2015 by Steve Balestrieri. The Patriots get ten days to prepare for the Washington Redskins after playing in Thursday night football last week against Miami. It is a needed break as the injuries have been piling up especially along the offensive line. The Redskins (3-4), are coming off of their bye week and are locked into second place in the NFC East. In their last game action on Oct. 25, they scored 24 second-half points to come from behind to defeat the Tampa Bay Buccaneers 31-30. Kirk Cousins threw for three second half touchdown passes, the last one with 32 seconds left as the team made its biggest comeback in franchise history. The Skins trailed 24-0 in the second quarter before mounting the comeback. The Patriots blasted the Dolphins 36-7 on Thursday Night Football as Tom Brady led the way throwing for 356 yards and four touchdowns. The Patriots defense bottled up Lamar Miller and held him to just 15 yards on nine carries. The game is scheduled for 1:00 p.m. at Gillette Stadium and will be televised by Fox and can be viewed locally on Fox 25 TV. Skins Still in the Hunt in the NFC East: One of the facts of life in the topsy-turvy NFL is that there aren’t a ton of teams with winning records in 2015. So the Skins are technically very much in the hunt for the division lead in the weak NFC East even at 3-4. Without playing, the Skins picked up a half-game on the division leading Giants (4-4), courtesy of their 52-49 shootout loss to New Orleans. The Cowboys (2-5), dropped their fifth game in a row without QB Tony Romo. The Skins and Eagles are tied at 3-4 but in reality, everyone has a shot to win the division and the losers will undoubtedly miss the playoffs. So after a big come-from-behind win and a bye week, expect to see a very fired up and motivated Redskins team that will take the field in Foxboro. Regardless of how bad the division is…and it is right now, Washington has four remaining division games left on the schedule and more than enough opportunity to win the division. Regardless of how this game plays out, expect them to play fast and loose the rest of the way. Lack of Stability at QB Still Haunts Team: Even though Jay Gruden announced in preseason that starting QB position was Kirk Cousins’ and he’s performed well at times, it is still a position with more questions than answers at this stage. Washington has spent five high round draft picks to acquire Cousins and Robert W. Griffin III since just 2012. Cousins is by far the best candidate to run Gruden’s West Coast offense, and he’s shown flashes of being a very good quarterback. He orchestrated a 15 play, 90-yard drive in the final minutes to defeat the Eagles 23-20 in early October. His second half against the Bucs was very impressive as he went 21 for 25 with three touchdowns and put together an 11 play, 80-yard drive capped off with a 6-yard touchdown pass to tight end Jordan Reed to win the game. But far too often he makes critical mistakes and has been prone to turn the ball over often. In four games in 2015, he’s had two interceptions. That isn’t going to be a winning formula for a team that has to claw and scratch every week to win. Although he’s the better fit, Redskins owner Daniel Snyder is enamored with 3rd string QB Griffin, who has only dressed for one game this season. He’s shown the inability to run the West Coast offense, or the ability to set the protection as well as an alarming lack of pocket presence. But Snyder has poked into things before, and Griffin may be just one bad performance by Cousins from starting again. Washington Running Game Stuck in Neutral: The Redskins ran the ball very effectively the first two weeks of the season, rushing for 343 yards and being first in the NFL in that category. Since then, the offensive line has struggled to open holes for the backs and the Skins have fallen to 21st in rushing. Alfred Morris and Matt Jones have been sharing reps at running back in Gruden’s system and have both suffered from the lack of consistent snaps to get a rhythm going. Morris, 5’10, 224 and Jones, 6’2, 231 are bigger backs that haven’t been utilized much in the passing game. Morris had 121 yards in Week 1 but since then has only managed 181 yards since. Last week, partly because of falling behind 24-0 early in the game, he managed only five yards on six carries. In the last three weeks the OL has only been able to spring him for 41 yards on 25 carries. One of the Patriots goals will be to make the offense one-dimensional, so this will be an area to focus on this week. Redskins Defensive Concepts Not a Great Matchup for NE: You can expect some changes to the Washington defense this week. The Redskins have liked to line up with a Cover 3 scheme for much of the season and go with four pass rushers. The way to beat that is for the offense to go vertical which opens up big areas to work in underneath, particularly in the middle of the field. 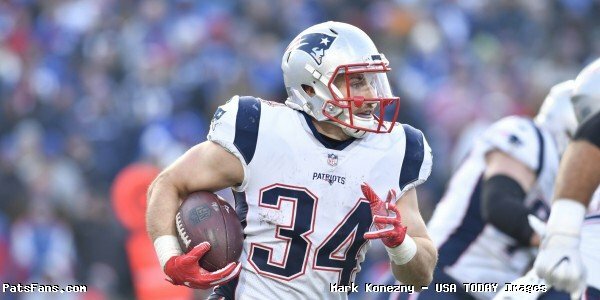 With an offense like NE’s where they split RB Dion Lewis out wide, it would force the Skins into more of a man coverage scheme and single up TE Rob Gronkowski on the linebackers. That is a scenario you can expect the Patriots to try to exploit on Sunday. With Gronkowski and Lewis operating underneath, this will put a lot of stress on the Redskins linebackers. Special Teams May Play a Big Role: Washington has struggled in punt coverage this season and overall the team’s special teams units struggled at the beginning of the season. Knowing the emphasis that Bill Belichick places on STs, this will be another key area to watch for. They gave up a punt return for a touchdown in Week 1, and had blocked punt for a safety in Week 3. But lately their play has improved, Kicker Dustin Hopkins has made 11 of 12 field goals and has been good at putting his kickoffs into the end zone. The team is doing a great job in the kick return game but still lagging badly in the punt return game. The Skins have blocked a punt and recovered an on-sides kick but their directional punting of Tress Way and their coverage of punts in general, (15.9 yards average) is an area that the Patriots with Danny Amendola and Julian Edelman will look to exploit. This entry was posted in Patriots Commentary, Patriots News and tagged 2015 NFL Season, Alfred Morris, Bill Belichick, Danny Amendola, Dustin Hopkins, Jay Gruden, Jordan Reed, Julian Edelman, Kirk Cousins, Matt Jones, NFL, Patriots, Pierre Garcon, Rob Gronkowski, Tom Brady, Tress Way, Washington Redskins on November 2, 2015 by Steve Balestrieri.